SIMA STAR 16 Rebar Stirrup Bender: Max. Bending Diameter: 16 mm; Engine type: Electric three phase 415V; Power: 1.5 Kw. Shop online with free shipping and returns on rebar stirrup benders in the UK. When it comes to rebar processing, SIMA offers quality products you can trust. Shop online for the Star-16 stirrup rebar bender with free shipping and returns for customers in the UK. 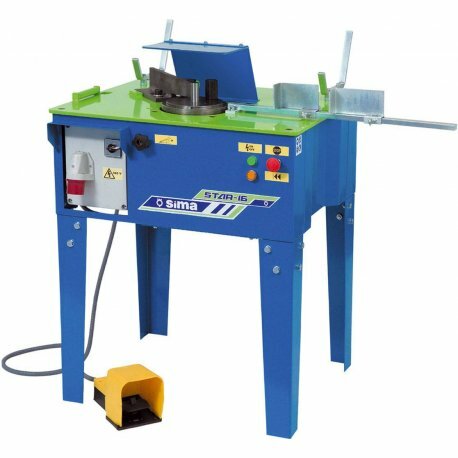 The SIMA STAR 16 rebar stirrup bender makes bending bars and stirrups easier and more efficient than ever before. With maximum performance and high operating speed, the electric SIMA STAR 16 is able to make polygonal stirrups in any required dimensions and shape with rebar up to 16 mm in diameter. Compatible with both smooth and corrugated rebar metal. The Star-16’s design allows you to easily alternate between rebar bar bending and stirrup bending in any shape and at any angle you could need. Simply adjust the distance between the support square and central bolt according to the length of your rebar, adjust the distance between the stops to determine the measurements of your stirrups, and adjust the pivot to determine the angle of the bend. An additional angle regulator gives you more precise control over the stirrup bending angle. Because of its convenient foot pedal operation, the operator has both hands free to hold and adjust the rebar being bent. This also protects the operator’s hands from being trapped while the machine is working. In addition, the work area is protected by a safety guard with a transparent viewer that allows the operator to see the rebar before and after being bent, allowing them to keep their hands out of the bending area. Thanks to its stainless materials and epoxy-polyester coating, the SIMA STAR 16 is highly durable and resistant to corrosion. It features removeable legs for easy transport.